It's almost time for the draft. What I consider the second best time of the year in the off-season for the NFL, Free Agency is first in my thoughts, but first in what kicks off a new football card season. Where rookies end up and whether they can start right off or not matters in any 2015 football product you buy. I think we are pretty much sold on at least one starter in Jameis Winston, who won't only be the number one pick, but should start for the Buc's. But after that, we just never know. To celebrate the draft today, I decided to show off both of my breaks of the first 2015 football card release of the year in Sage Hit. 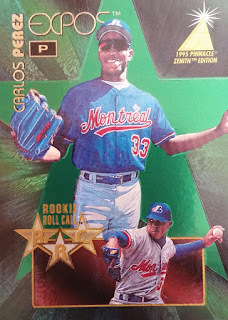 This time I am showing off recently released High Series with players that weren't in the Low Series (showed off earlier), along with some fan favorites that carried over. 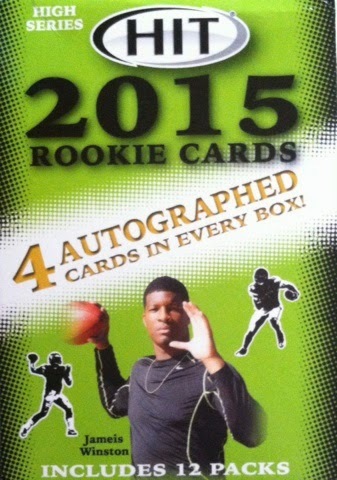 In every blaster box of 2015 Sage Hit, you get 12 packs with 4 cards per pack. 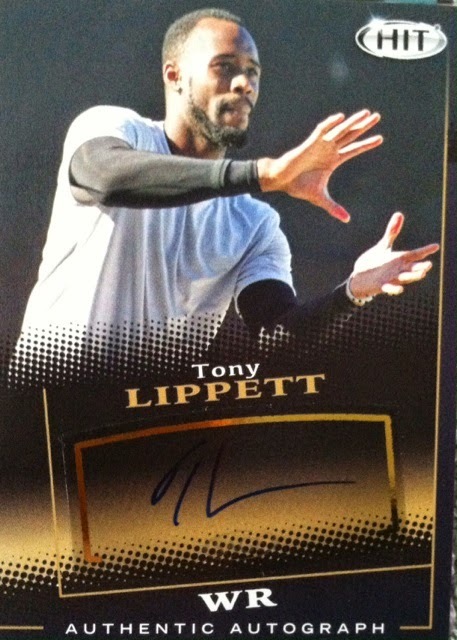 These also include 4 autographs per blaster which is an amazing amount of hits for a box only costing you $20. Like I stated earlier, players that weren't in the Low Series, show up here in the High Series such as Brett Hundley, Kevin White and Amari Cooper. 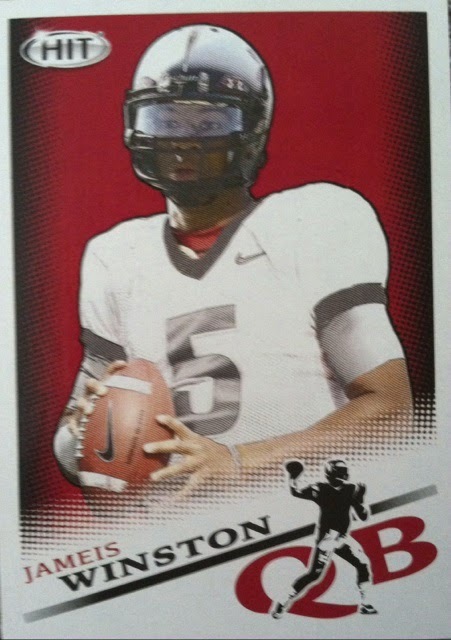 However, I think Mariota is not in this product. 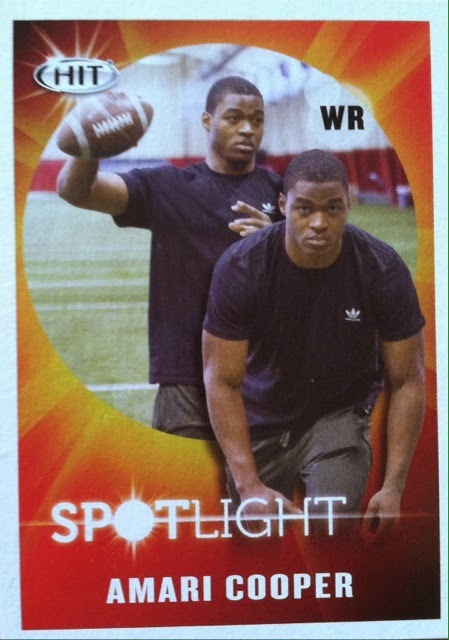 Spotlight subset makes its appearance in the High Series. These were not in the Low. New subset Five Star, looks great. I only pulled this one in the set. Artistry inserts. I pulled even more in the High Series than I did in the Low. I like the design. 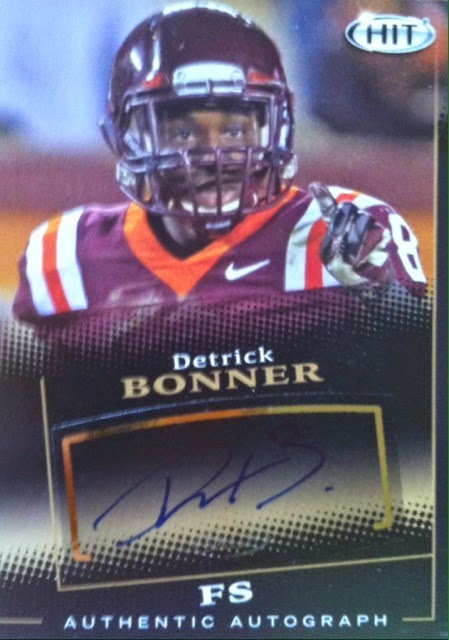 Bonner could be a force on defense for a team that needs a safety....hmmm...NY Giants?? 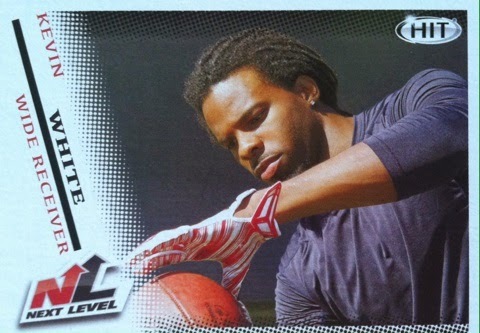 And Cook is one of the many WRs in this deep class. I have always enjoyed pulling these hand numbered autos. Overall, a great deal just like the Low Series. With 4 autographs in every blaster, it would be foolish not to give this product a try and to get some of the newest class of rookies this way. Once again, the only disappointment is the autographs being packed separately which means the 12 packs you open are all base. This years product as a whole is massively improved, if they can avoid packing those separate, that would make it even better. Let's see this happen in 2016 guys! 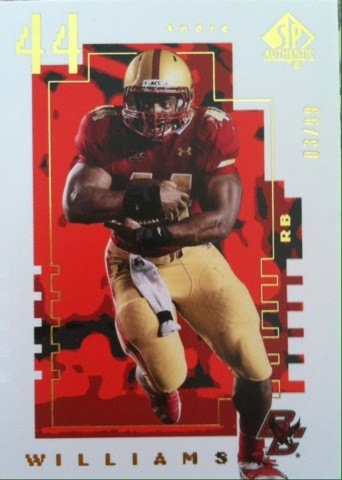 So far I have had a really slow-go of things in terms of 2015 football cards. Up til now I hadn't picked up any. That's right, ANY! I had to end that horrid streak and add some of these rookies to my collection. 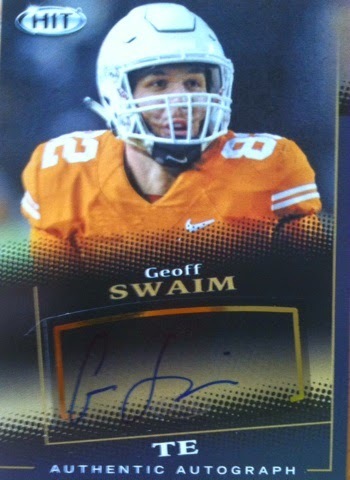 My first rip of the 2015 football card season, Sage Hit. 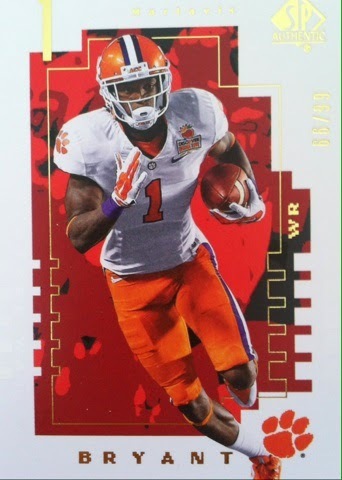 It's always the first rip of the new football card season. So what would make 2015 any different? 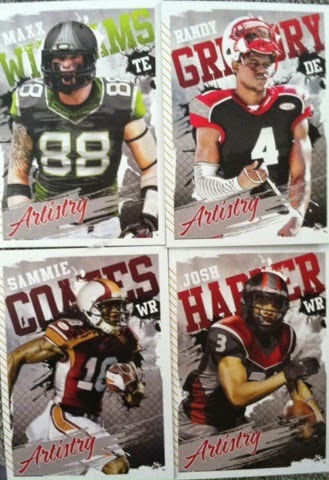 This years Sage Hit retail is loaded! Four autographs. Yes, FOUR autographs for a retail product. Try to tell me another product you can get four autographs in for $20. You can't. 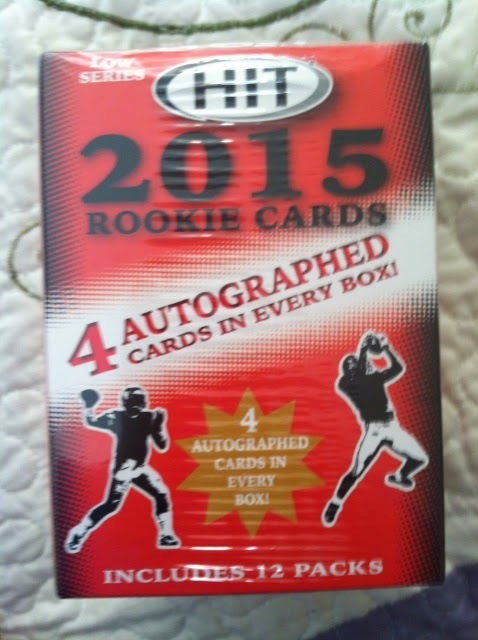 In every blaster box of 2015 Sage Hit, are 12 packs with 4 cards per pack. You also get 4 autographs and each blaster is $20. The design this year is a bit different as well. 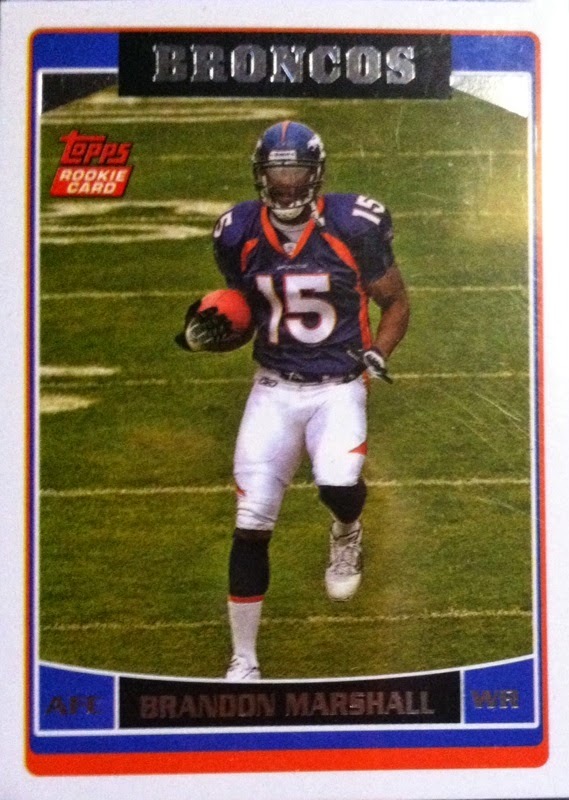 Think Topps Heritage. It has that throwback feel and literally feel to them. No more of the high gloss that we are used to. 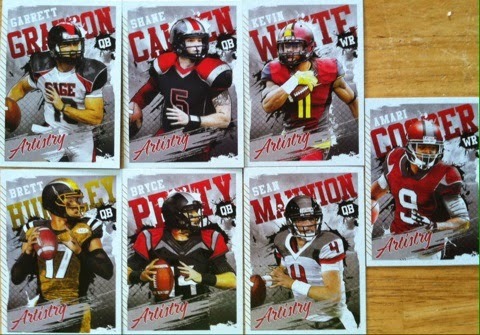 I think it's a nice switch and that the base cards look good for an unlicensed product. Inserts. Even these look great I think. These seem to fall 1:3 packs. Now onto the autographs. I didn't it anybody big but I guess anyone can be anyone since the season hasn't started yet. There could be Pro Bowl player hidden here. The design isn't bad either. 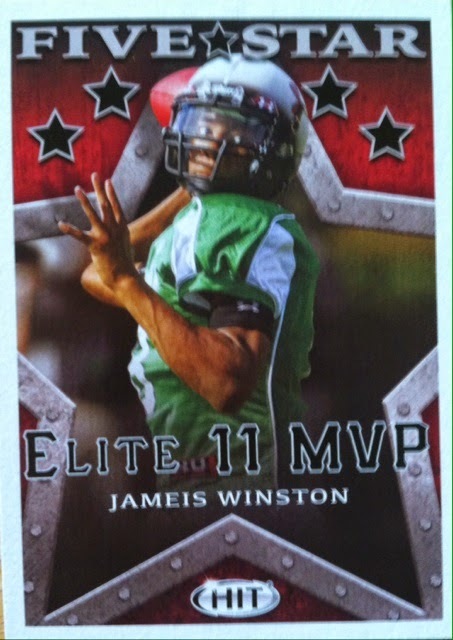 Overall, despite my lack of big hits, I have seen blasters with Jameis Winston. 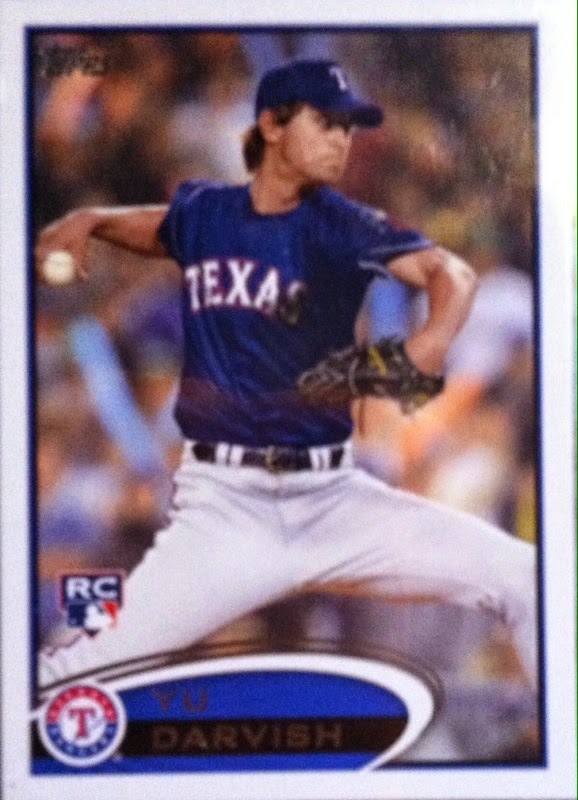 The big time players are out there to be found.I think you find plenty of value in every blaster. Well worth the buy. 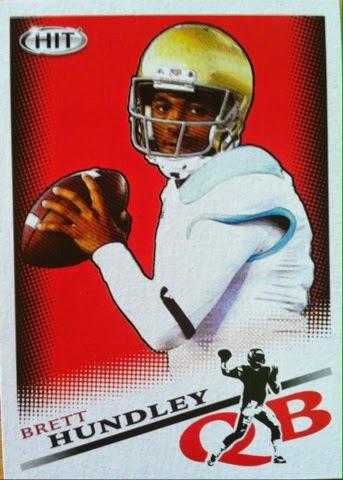 When 1995 Fleer football came out, I fell in love. Why? 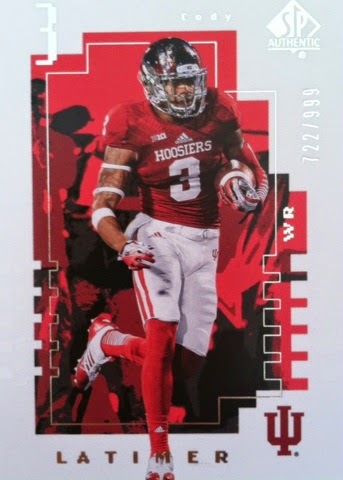 The base card design was a bit unique but more unique was the cool designed inserts in product. One of them was Gridiron Leader. 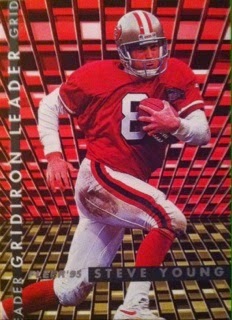 These had little squares that matched team colors and makes the player appear like they are on a dance floor. The card has a 3D appeal also because of this design. It's pretty cool. 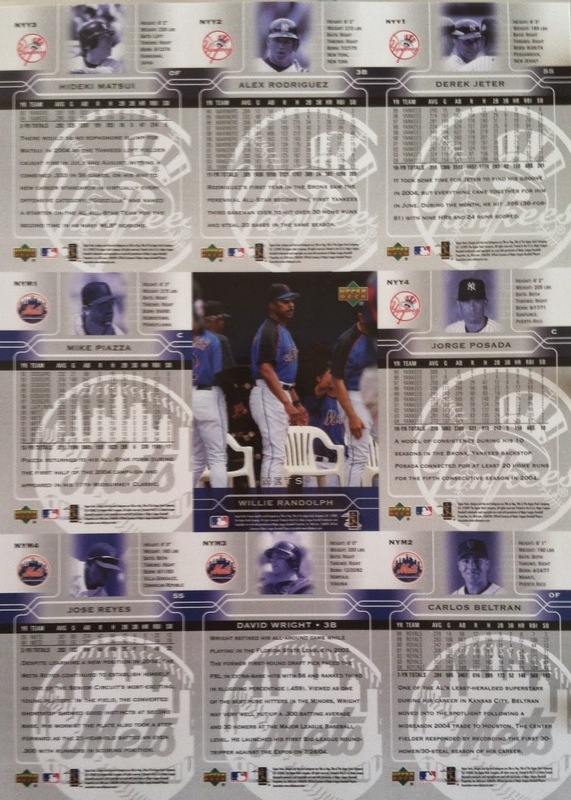 My search for hard-to-pull and I couldn't afford at the time insert/autograph pulls from the 90's chase continued. 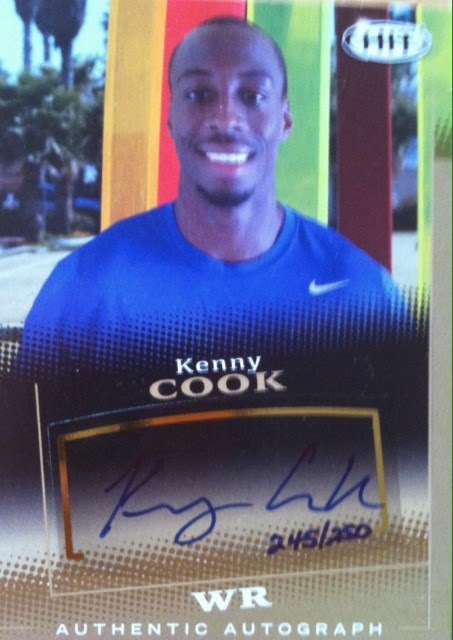 This time my search led me for a 1997 Topps Stadium Club Co-Signer card that I believe was the first dual signed card. 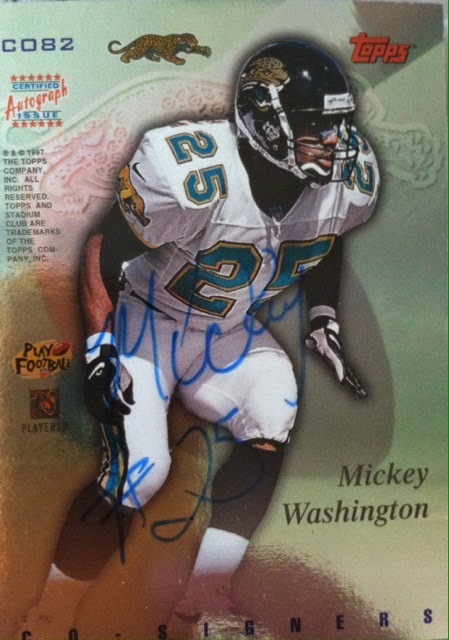 These front/back signed autographed cards fell at a rate of 1:70 packs in 1997. That was a year where I ripped through a few boxes of the product and never hit one. Though back then that wasn't my reasoning for opening it as Stadium Club had a superb base card design and some nice inserts that year. I will show one of those in an upcoming 90's Flashback post. In the meantime, I will show you my newest pickup. Upon searching Co-Signers on eBay, which by the way are not cheap, I stumbled upon one on sale for $3. Not to mention FREE SHIPPING. How could I not pick it up? 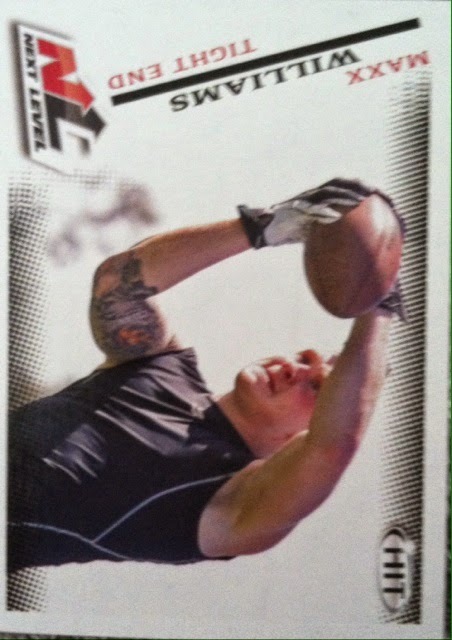 And it wasn't like I didn't know at least one of the players on the card. I actually saw a lot of him in the 90's in my packs. So here it is, $3 and glorious! 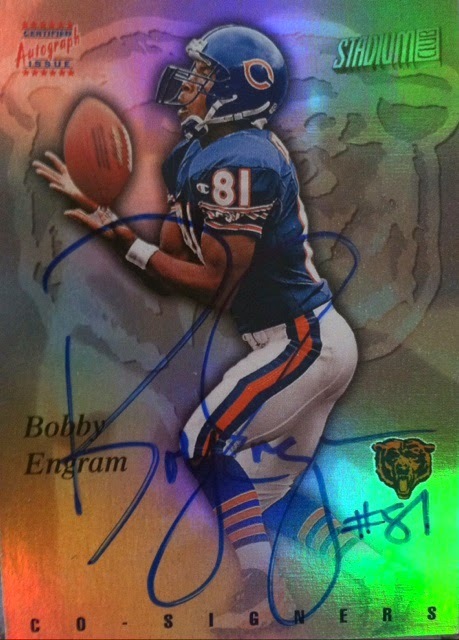 Love the rainbow foil and wished they had done it front and back but it is still an impressive looking card. Glad to have crossed this one off my want list. Now onto the next part of my 90's card journey. Where that will lead me, only time AND money can tell. Another Day, Another Andre. VERY Low #d Too! After getting a response from Williams about my collection when I posted it a few weeks ago, I went on a four day splurge picking up four new autographed Williams cards. How often is it when one of your PC players recognizes you collecting them? Show of hands...yup, not too many. That alone drove me to keep adding to that part of my PC. 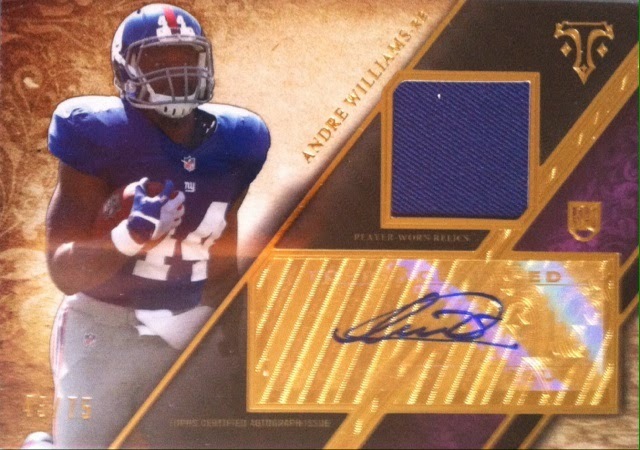 Before I continue on, I must note I plan on showing those tweets in an updated post of my Andre Williams collection next month or so. Anyways, this is probably the most I have spent on one of his cards yet. I usually won't spend over $6 a card but this one being 3/5 and the rarest of his I would have, splurging $26 in a eBay auction wasn't too bad. I will show off the other three new pickups soon! Every Sunday on Twitter, a group of guys run what they call #SundayFunday. #SundayFunday is a variety of contests run by those guys using that catchy hashtag. One of those guys is @danblair83. And that's the very quick back story on what led to this mail day. @danblair83 is one of the good guys on Twitter that not only does contests, but also likes to discuss the hobby as well.Those two things combined is why I followed. 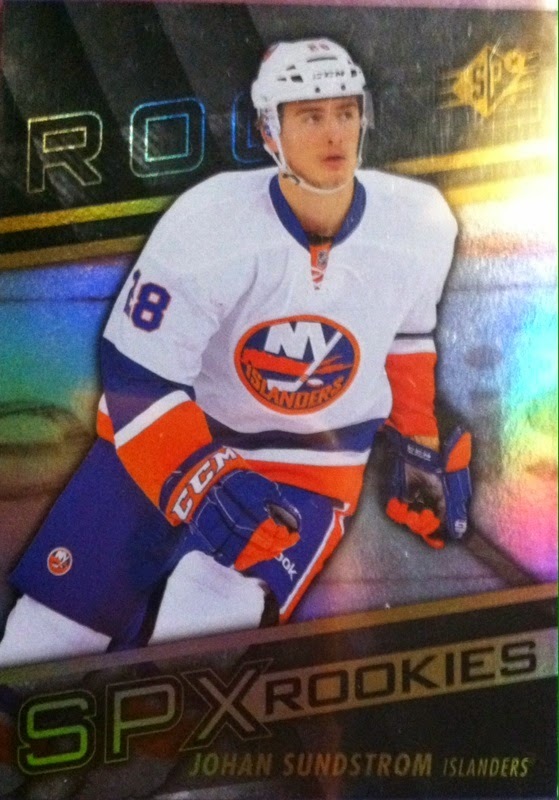 Last Sunday I was one of the lucky #SundayFunday winners and the prize lot consisted of rookies. If you have read this blog before, you know that is right up my alley. But enough with my jabbering, now onto the good stuff!! Will be interesting to see how this guy does for the Jets. 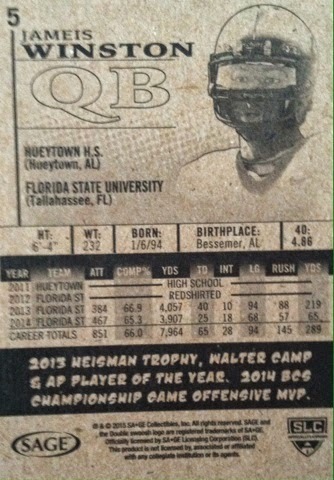 I can see him having a big season if the Jets can find a QB to throw to him haha! And to finish off this mail day, two more awesome Beckhams for the PC! A big thanks goes out to @danblair83 for this nice mail day and helping pad my rookie card PC a bit more. If you are not following him yet, please do so. Sp Authentic. 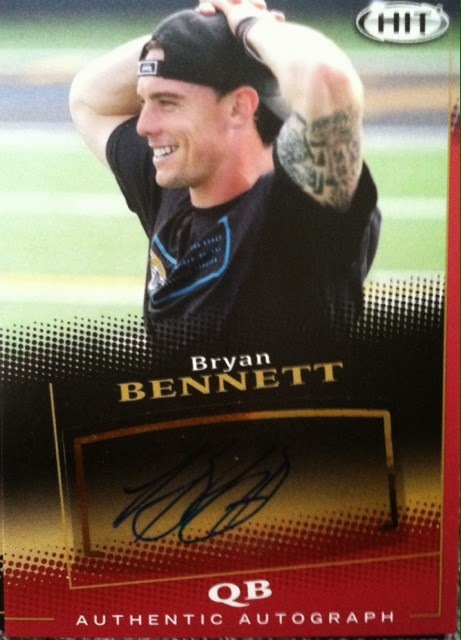 One of my favorite Upper Deck releases year in and year out. Sadly, this could be literally the year out with Panini owning the CLC license now. 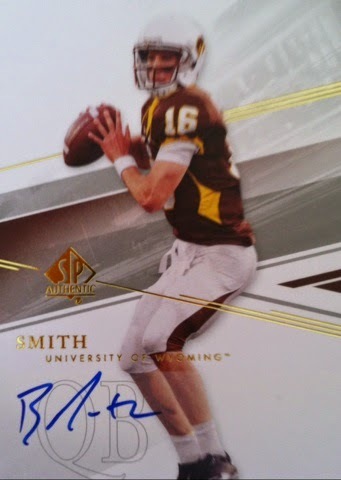 Not quite sure how the hobby is going to look without the awesomeness that Sp Authentic brings. I know UD could go the unlicensed rout, but it would never be the same. I guess in the meantime, we can still enjoy what could be the final edition. 2014. For some reason my post is lacking both the box picture and the base card picture, if you really need to know what the base cards look like, just peek below ahead of time at the autographs. I am still doing a breakdown of a box without the picture. 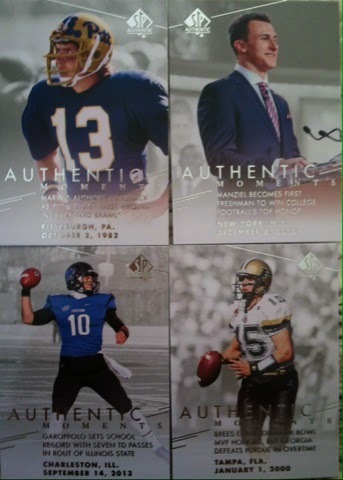 In every box of 2014 Sp Authentic football you get 20 packs in a box with 5 cards per pack. Each box will run you around $100 and will have three autographs (including one patch auto) along with four canvas cards. There is also three SPA Future Watch inserts # to 999 or less per box as well. You see here numbered to 99. And I got my boy Andre!! Another thing I really enjoy about the product is the Canvas Cards. 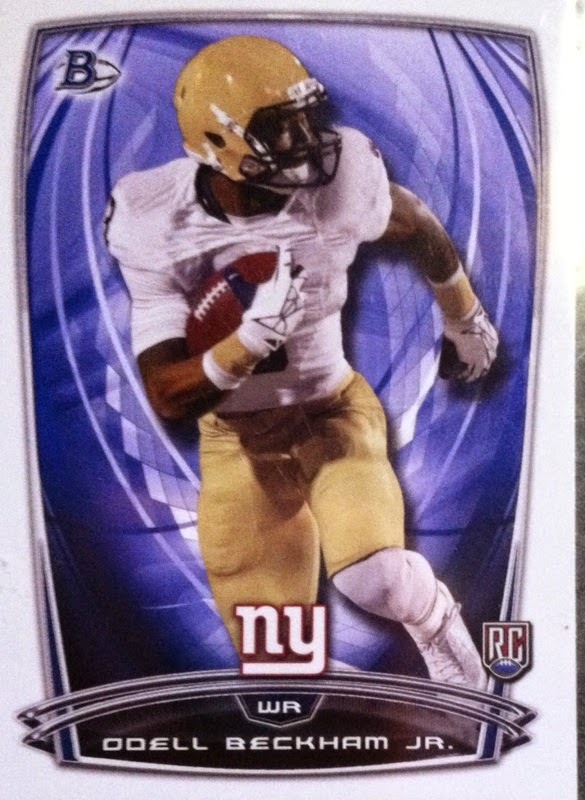 These are really cool especially when you get players like Odell Beckham and Peyton Manning in your box. 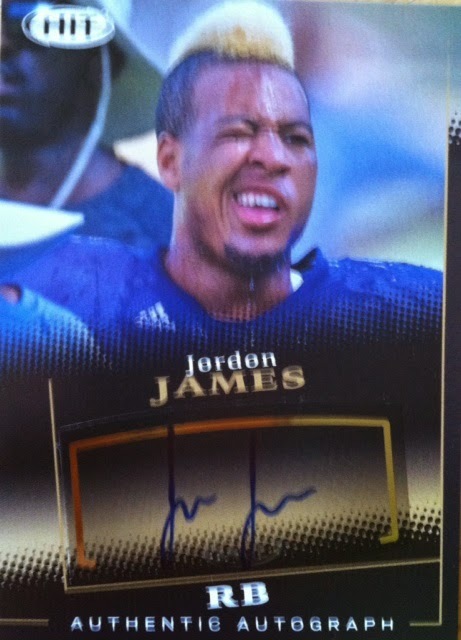 And what I consider the "big hit" of every box turned out to be a guy I have seen multiple times. Once again introducing....Mr. Terrence West! I do however like the design and the two-color patch. 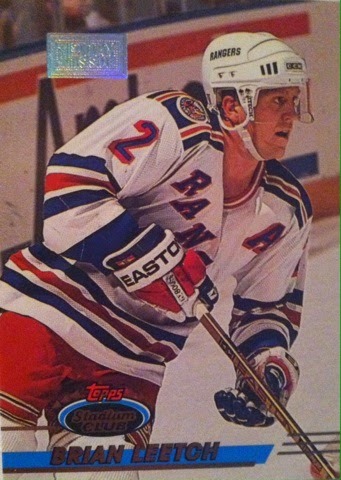 Overall, Sp Authentic didn't at all provide big hits here, but it provided what it always has, a well built product. I like this years even more due to the base card set up. I am a set collector so having a challenge makes these base cards more exciting. The last few years a box would provide you with two complete sets. I like this setup more. Hopefully this isn't the last time we see Sp Authentic. Cause I will sure miss it. To celebrate the Yanks vs Mets in the final game of their series, thought I would show off a Yanks vs Mets piece I have. In 2005, the New York Daily News distributed these in their newspapers one Sunday. 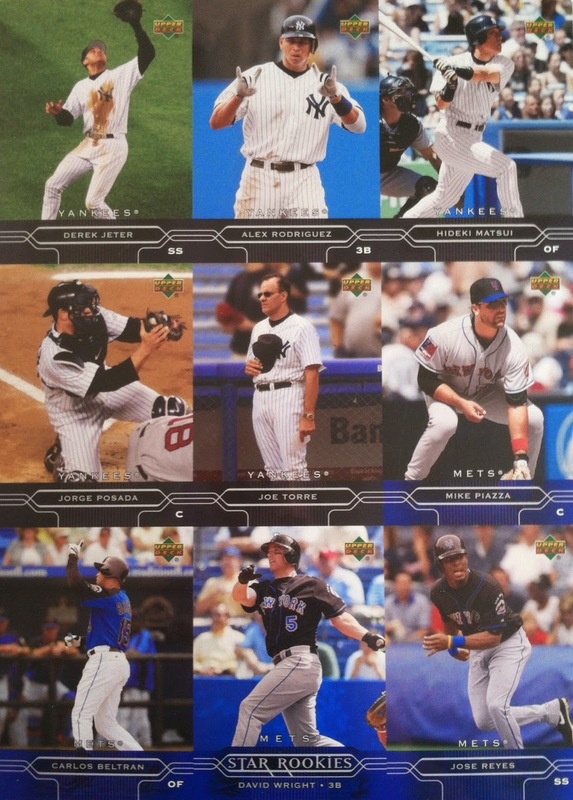 It's a 2005 Upper Deck uncut sheet. It was great seeing these be made by Upper Deck and their amazing photography. The New York Daily News is one my favorite reads and these were definitely an added bonus especially with the likes of Jeter, Matsui, Posada and Torre. Notice how I left off A-Rod, he still doesn't exist to me. Once on the steroid list, always on it to me. 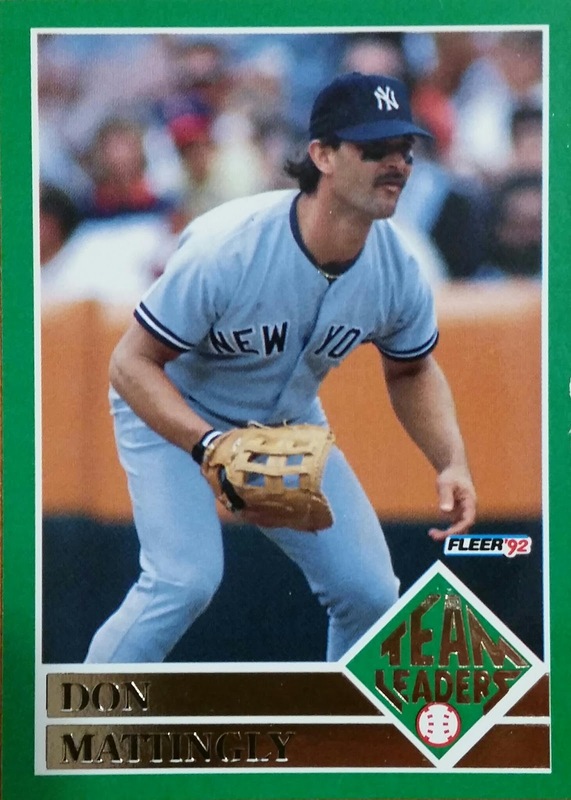 Anyways I found it a unique collecting piece for my Yankees PC. So much that I picked up two that Sunday. I actually haven't ever seen any free cards in a newspaper since. Back: I like how they put the two managers back to back. The first two games of the series have been good, especially the first one haha. The Mets look good this year and the Yankees have played a little better than I expected. Should be a great finale tonight. The biggest question is, which of these teams could we be seeing play in October? Could they face each other like in 2000? Once the baseball playoffs begin, you just never know. Either way, tonight's game I say GO YANKEES! Time for Part 3! In Part 2, Stadium Club survived the lack of votes but it's the photography that seems to be advancing it. Will Stadium Club up it's win streak to three? Will they fall? Who will win is ALL UP TO YOU!! So here is the lowdown on this NEW fun card game! I thought it would be fun to do a BATTLE OF THE..... CAAAAAAAAARDS (picture a deep voice and drawn out ending). If any of you watch SportsCenter, you would know they have a segment called the Best Of The Best where they pin two of the best plays against one another. One play may have been from previous days in a row against a new one. The goal is to narrow down the best. Well, I want to do a Best Of The Best card version but mine is called This vs That. I will put a post up such as this one and you will have one week to vote on one card or the other by telling me in comments which one you like more. There will be one card from the 90's, one card from the 2000's. There will be a variety of sports versing one another. This contest isn't to pin sport vs sport. Voting is based upon the OVERALL card and looking at things such as design, creativity, photography and eye appeal. 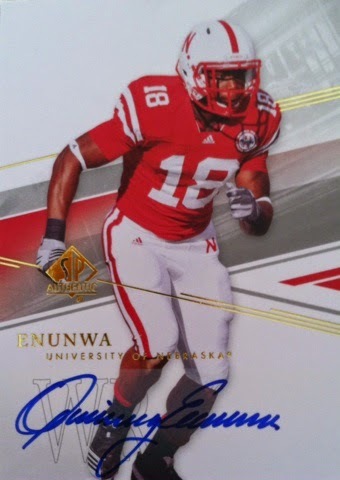 Don't judge a card because it's an autograph or jersey card vs a base card. 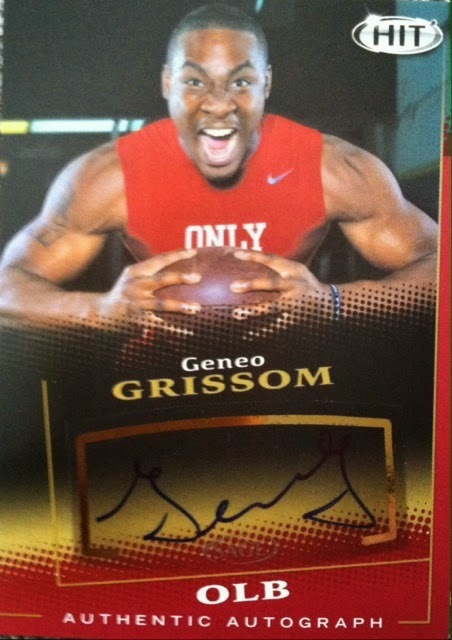 This "contest" is to see which card is OVERALL better and not just because it's signed or has someone's memorabilia. Same goes for the inserts vs the base. I will try my best to make them the fairest I see possible. After a week of voting, the card with the most votes moves on to face another card. A card that loses cannot be brought back nor can its design.Example is if I use the 1993-1994 Stadium Club hockey card design, I cannot use the 1994 Stadium Club football card design later on as they are most likely the same thing. The designs on the cards must be different. I will keep a tally on which cards have won and how many times they have won at the top of the next weeks post. I am not sure when I will end the overall "contest", maybe by the end of the year, let's see how many voters show up first. But, the goal is to see which card ends up being the best and which era gets more wins. Now let's move onto the next round of This vs That! Put your vote in below in comments on which card you like best, OVERALL. What started out as a conversation with one person that I thought may be interested in a 8x10 Panini Sammy Watkins autograph, turned into a conversation with another person and a completed trade. My conversation began with @dpalagi518 who I started a discussion with to trade the Watkins. In the midst of our convesation, he suggested that I go discuss my trading piece with @GregorioGuindon who was collecting Watkins and might enjoy it for his man cave wall. Trusting @dpalagi518 suggestion, I started my trade talk with @GregorioGuindon and we were able to work out a trade pretty fast. I also added in a few other cards in the trade as well. I was happy with what I was receiving that the fact that I was able to find someone who would enjoy the Watkins more than myself. This one is numbered to 49. I love the look of it with the rainbow shine. One of my very few Topps Triple Threads cards. 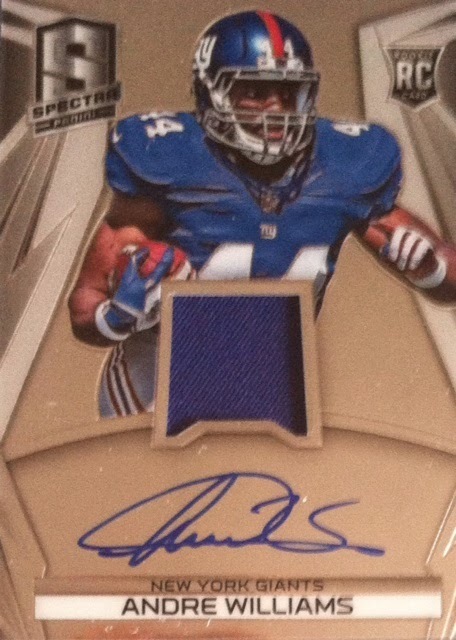 This is a nice addition however the auto seems to get lost in that big gold box lol. 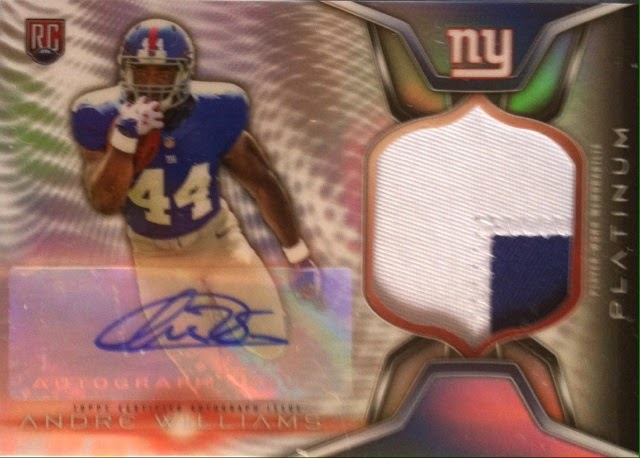 Then this sick patch auto. Look at that patch!! All of these Williams were new adds as well. Not only did he trade me those, he threw in some FREEBIES! 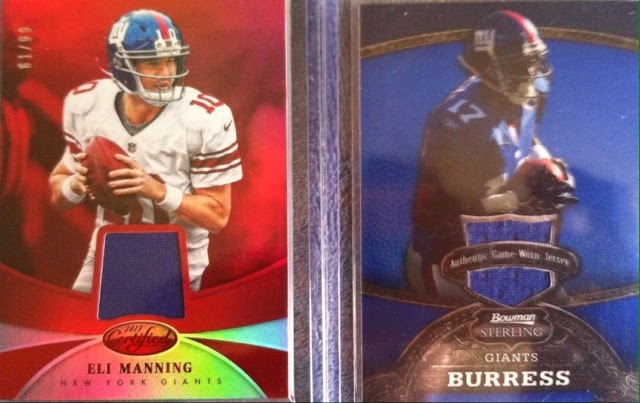 And also a Eli and Plax jersey cards. I really miss watching these two hook up in the Red Zone. If only Plax hadn't made one mistake in his life who knows where his career would be right now. 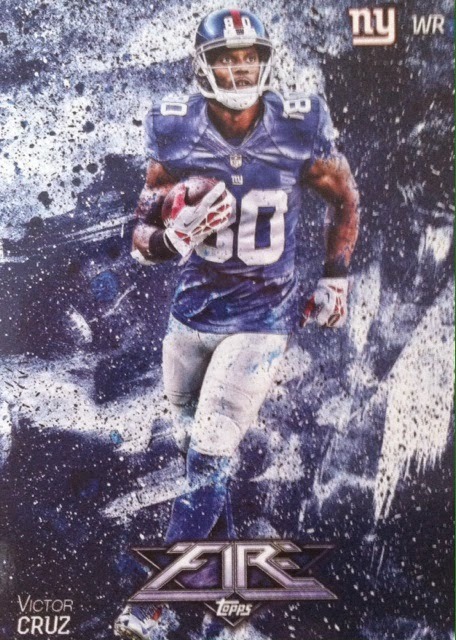 Anyways, it's my first jersey card of his as well. A big thanks goes out to @dpalagi518 for suggesting I go make a trade with @GregorioGuindon. And a HUGE thanks goes out to @GregorioGuindon for being an awesome trading partner who is now added to my trade circle. Thanks again for the extras as well. Much appreciated!! If you have Twitter and are not following either of these guys, you better go click that follow button. Great guys and highly suggested trading partners. Every preseason there seems to be that one standout player that you weren't expecting. And if you watched the preseason in 2014, you know the one name you heard continuously, Corey Washington. 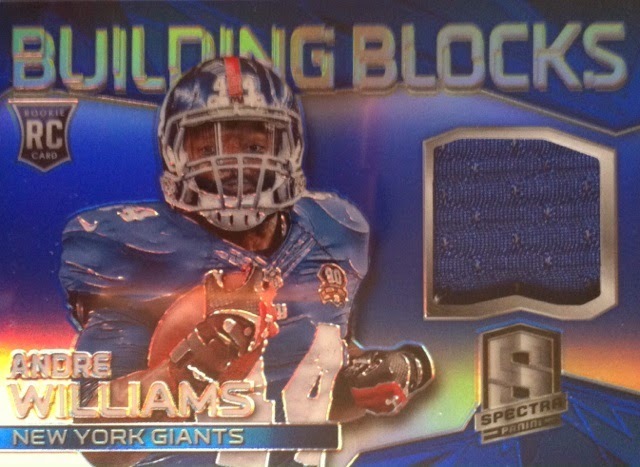 This guy was making Odell Beckham type catches in the preseason and was someone I looked forward to seeing on the field in 2014 as he seemed to be the WR/Red Zone piece the Giants were missing. However, he fell down the depth chart with players like Preston Parker stepping up and the game-changer that turned out to be Odell Beckham and all of a sudden you have a forgotten guy. 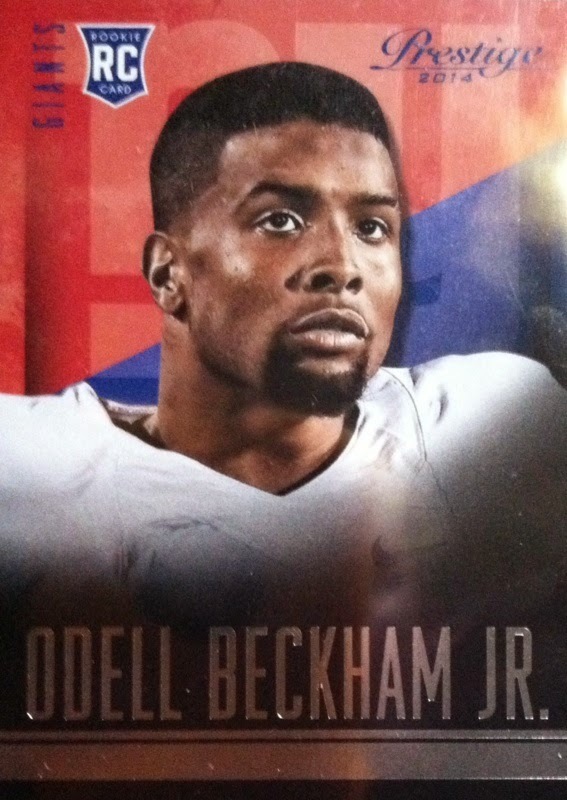 A guy who led all receivers in receiving yards in the preseason and who I thought would become a household name. I never forgot about him. Nor did I forget about the amazing plays he made. I remembered what happened in 2010 when Victor Cruz came onto the scene and ripped defenses apart in the 2010 preseason before sustaining an injury. Fast forward and see where Victor Cruz is now (with the exception of last years season ending injury), he is a Pro Bowler. Will Corey Washington be able to make an impact in 2015 for the Giants? Hard to tell. The G-men have much depth at the position and he has at least Cruz, Beckham, Randle and newest Giant Dwayne Harris ahead of him. He has truly got to have another standout preseason and training camp to prove his worth and maybe save himself a roster spot. 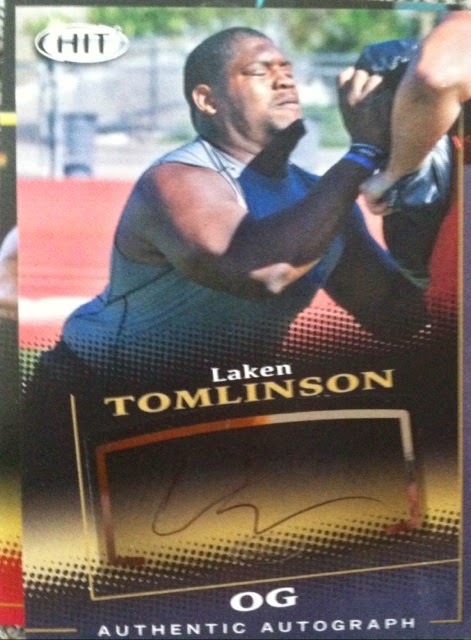 If for some reason he doesn't make the Giants roster, I would be surprised if he doesn't land elsewhere. 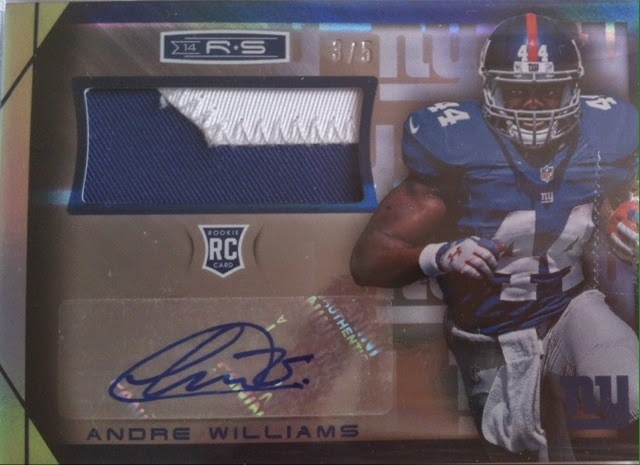 Despite his lack of playing time in 2014, he is still a Giant at this point and I found it worth at least picking up his rookie autograph at a cheap price. Cause you just never know. Another One? Yes, Of Course! No, this is not a repeat post. This is a totally new card but the same card. Confusing huh? When I had the opportunity to add a piece of baseball card history to my collection again this time at a much cheaper price, I couldn't go wrong. 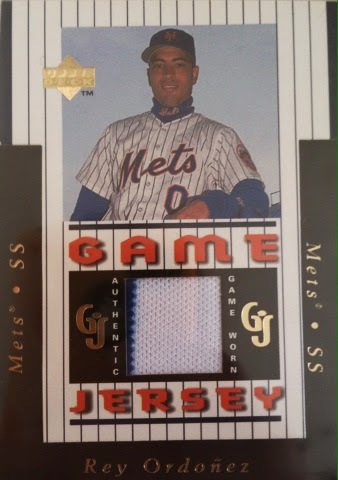 So, once again, another Rey Ordonez 1997 Upper Deck Game Jersey Card. Not as nice of a swatch as the first time, but still a nice card. And if you had forgotten what the first card looked like, here it is again. 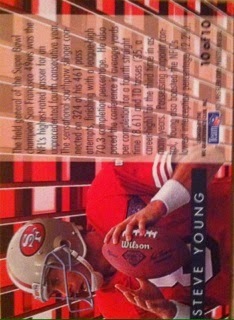 I still need to chase down a Gwynn, very cheap on Dacardworld but I haven't had the chance to get it yet. Of course I would need the Griffey too, in order to have the set. In the meantime, I will bask in these two. 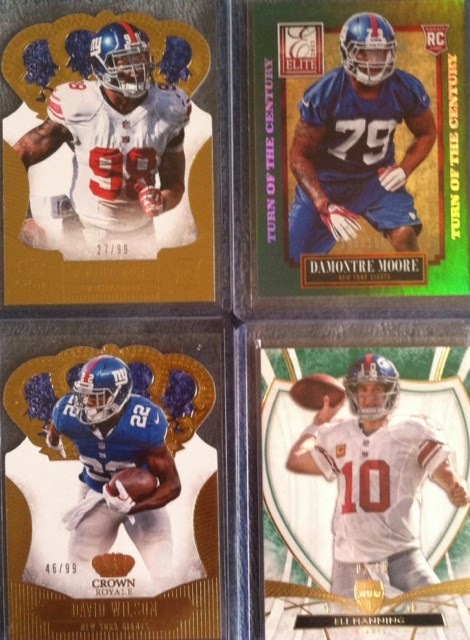 Trade Mail Day:Hop, Dre, And Black Gold Viewings! Grady M. Mail Day Part 1:Insert MADNESS!